How can I get the grass off the bottom of my RIB? I left my 2 year old Avon RIB in the water, at the dock, for the past 3 months. Now there is about 12 inches of grass and other stuff growing off the bottom. The boat won’t get up on plane and hardly moves through the water. I hauled the boat and tried washing it and even scraping the stuff off, but it’s real hard to get off and smells awful. Do you have something to clean this mess or did I ruin my boat? No, you didn’t ruin your boat. This is a frequent problem with boat owners that don’t do anything to protect the bottom of their inflatable and then leave them in the water or tow them behind their boats, when cruising. You should be able to get it looking new again. The first step is to use a deck brush or pressure washer, if you have one, and remove as much of the heavy growth as possible. Be careful not to use too much pressure in the washer or get too aggressive with the brush, otherwise you could lift the seams or damage the fabric. Next, spray Aurora Inflatable Bottom Spray on the marine growth. Wear eye protection to protect your eyes and rubber gloves to protect your skin. After about 5 minutes give it a light scrubbing with a deck brush to make sure that the cleaner penetrates to the substrate. After about another 10 to 15 minutes, rinse it off with a garden hose. If its real heavy or if you have Barnacles or Zebra Mussels attached, you may have to repeat the cleaning process several times, until it is all off. You can also clean the lower leg of your outboard with Inflatable Bottom Spray. When you get the growth off, clean the entire boat with Speed Clean. You can use this on the fiberglass as well as the fabric. 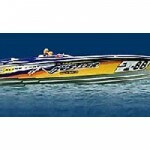 This will get any remaining dirt, diesel, soot, bird and insect droppings and stains off your boat. At this point, it should be good as new. To protect your boat from future soiling and staining, I recommend that you give all the fabric surfaces 2 coats of Poly Guard. Not only will this product give you a great looking, easy to clean, shine, but it will also protect the fabric from UV, suntan oil and staining. 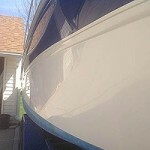 You will find that your boat is much easier to keep clean when protected with Poly Guard. 2 coats should last 4 to 6 months and it’s not greasy or slippery. To protect your bottom against attachment of marine fouling, put 2 coats of Repelin on all underwater surfaces, except the prop. Repelin can be applied right to the fiberglass but not to the fabric. The fabric must be protected with Poly Guard first. This perfectly clear coating that contains VS721 Bottom Coat, a fouling release barrier coat. Regular use of your boat will keep the bottom clean. If your boat remains stationary for long periods of time, you will still get a bit of slime, but this can be wiped off with a sponge. You may also wish to protect the non skid floor with Sure Step. This is a non-slippery polish that will protect your deck surface from UV chalking, staining, dirt and make it very easy to keep clean. After going through all the hard work of cleaning your boat it’s a very good idea to protect the surfaces in order to minimize degradation from the elements, make your boat easier to maintain, and looking new and shiny. Your boat will be the envy of the marina.